If top meat and a badass grill are all you need for a decent steakhouse, then Hawksmoor Seven Dials is absolutely superb. 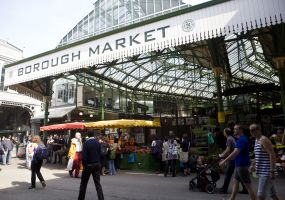 Their Longhorn beef, supplied by The Ginger Pig and dry-aged for a minimum of 35 days, holds the sort of flavour that makes you lose control of bodily functions. Your eyes close, your face contorts to a gurn, and you moan and slobber like a zombie in sight of an attractive blonde named Barbara. After the first bite, if you’re married, your spouse may ask the question “is that really necessary?” and you know without opening your eyes they’ll be looking at you with a mixture of amusement, embarrassment and scorn. Yet you can’t apologise because to do so would be to tell a lie. This beef is as good as beef gets; a producer of such juicy, voluptuous, carnivorous joy as cannot be described. If your natural reaction to it is that of a stroke victim having his prostate examined, it’s something you can live with. Of course the grill has a lot to do with provoking this response as well. I’m used to (and generally prefer) my steak being cooked on a Josper these days, its hellfire heat turning the meat’s exterior into glorious, crispy carbon. But Hawksmoor’s charcoal-driven beast is just as effective despite its gentler persuasion. Where it can’t match the Josper for texture or retention of juices, it tops it through the flavour it imparts, the woody smoke of the char elevating the beef to even higher heights. It’s just a pity really that I want my steakhouses to offer a bit more than that. I’m not quite sure what it was that spoiled my meal at Hawksmoor Seven Dials. I left the restaurant feeling I’d had a fairly enjoyable experience but the more I think about it the more negative my feelings become. Yes, the 900g porterhouse my wife and I shared was awesome, and the bone marrow – wow! What a stunning example it was. * But almost everything else rankled. First there was our waiter, presumably moonlighting from a job as a payment protection insurance salesman, who was so relentless in his efforts to sell us a starter you’d have thought his children’s lives depended on it. Then there was the potted beef starter we eventually ordered to get him to go away and its Yorkshire puddings that had something of the Aunt Bessie about them. £8 for a jar of offcut meat, some onions and two circles of poorly risen batter – the beef was excellent but I didn’t feel like we got our money’s worth. With the mains we had mushrooms: flaccid rounds of soot black which’d had all the life sweated out of them. They tasted of nothing at all. We had triple-cooked chips too – not the beef dripping chips we’d actually ordered – and they were so dry and saturated with fat they could’ve been used for kindling. “If I didn’t know any better, I’d think these had been cooked from frozen,” I said, after trying a couple. They really were poor. It was a while before we were able to attract a waiter’s attention, get them to clear the table and present us with the bill. The cost of brilliant steak and bone marrow, a decent bottle of wine and a fair dollop of disappointment was around £180, which didn’t feel the best value. Our outstanding a la carte lunch at The Ledbury the following day was only about £40 more expensive, to put it in context. I think on the whole I actually prefer my local Gaucho to Hawksmoor Seven Dials. And that’s certainly not something I was expecting to say going in. 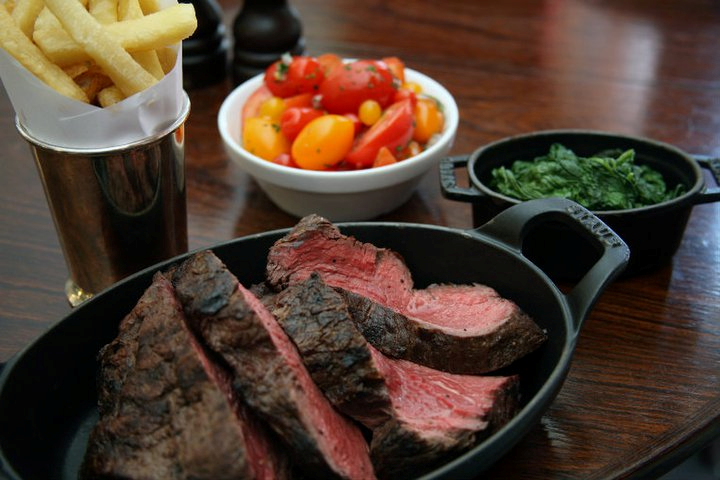 While Gaucho’s steaks don’t bear comparison with Hawksmoor’s, they offer a far more complete experience than we got on this London visit. Through half a dozen meals I’ve never had a complaint about any of their side dishes. Afterwards I took to Twitter to say the beef had been great but Hawksmoor is Championship standard versus the Premier League of Goodman. On reflection, given that Goodman Mayfair gave us a faultless steakhouse experience when we visited last year, I’d suggest the gulf is far bigger than that. *Thanks to fellow blogger Mrs Petticoat (@MrsPetticoat) for the bone marrow recommendation. The dining room reminded of the hall where I used to sit my music theory exams albeit with much poorer lighting conditions. Tables were heavily regimented and if the room hadn’t been packed I think it would’ve felt very cold. It was certainly buzzing and I reckon a lot of people probably like the stripped back, casual look they’ve gone for, but it wasn’t a room I personally felt comfortable in. I also felt the steak knife looked cheap and rubbish. I know it’s only a small thing, but when I went to Goodman and saw the knives they have I thought “this is a place that means business”. At Hawksmoor Seven Dials the cutlery reminded me of a Beefeater, in that I immediately thought “even Beefeaters have better knives than this”. It didn’t make quite the same first impression. Nothing ever seems to go right for me when I plan a gourmet holiday. Shops and markets are never open on the days I want them to be; restaurants are always booked up. I can’t count the number of times my schedule has been waylaid by mysterious ‘private functions’, which crop up with unnerving regularity whenever I dare to make a booking inquiry. Have I told you that the queen ruined my honeymoon plans last year? Well, she did. We’d been planning to go to The Waterside Inn on night one ever since we got engaged and the whole week was arranged around it. So desperate were we to guarantee our table that I rang them up the very second the booking window opened to make sure we got in. Turned out the royal family had reserved it for some sort of celebration. * We were forced to reorganise the entire bloody week! Naturally, as I shuffled hotels and restaurants around, more issues cropped up. We couldn’t get into Gordon Ramsay. Then we couldn’t get into Le Gavroche. 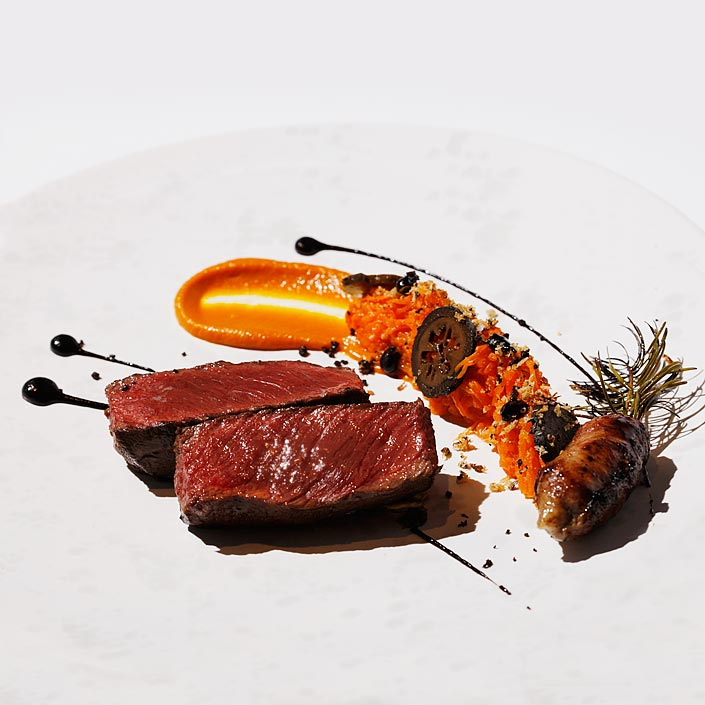 I had no problems booking Alain Ducasse – which was always on the itinerary – but when I rang them up a few weeks beforehand to inform them of my wife’s dairy allergy they said they had no record of the booking at all!! The guy at the end of the phone fortunately agreed it was the restaurant’s fault and sorted us a table anyway, but he didn’t manage to do so before my head exploded, splattering big gooey lumps of excitement and good will all over my bedroom wall. 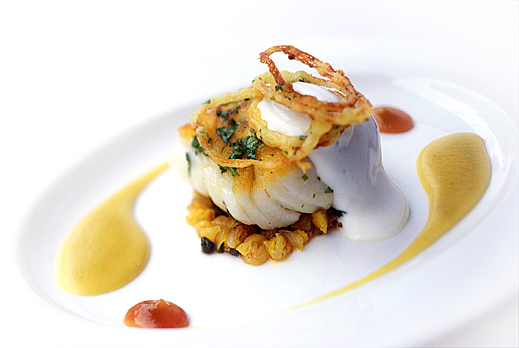 The original plan had been to do all the country’s three-star Michelin restaurants in a week, in this order: The Waterside Inn, The Fat Duck, Gordon Ramsay and Alain Ducasse (with a night at The Dorchester). After a month of headaches, we eventually settled for: Hibiscus, Goodman, The Waterside Inn and Alain Ducasse (with a night at The Dorchester). Not too shabby really, but a bit of a pain to cobble together. 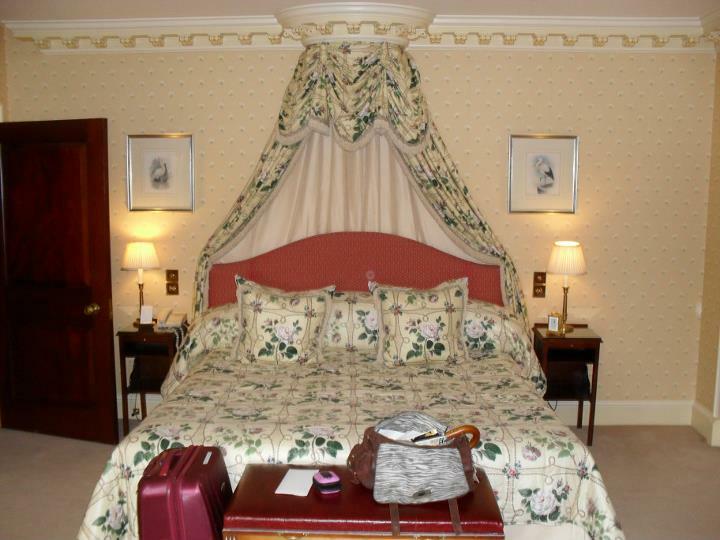 We wanted to spend the last night with a room and dinner at The Ritz. We booked a night at The Dorchester instead and tried to get into Le Gavroche. I uttered the follo… actually, that probably doesn’t bear repeating. I just seem to have no luck with these things; no luck at all. I know these places are popular, but when I go to book them as soon as is humanly possible, I’d expect to hit more often than not. It’s not like I’m trying to get into an El Bulli or a Next or somewhere where you might have to pay a few hundred quid on eBay in order to be sure of a reservation. Anyway, I should probably stop complaining. If there’s anything to be learned from going through this experience again, it’s that you should always have a back-up plan for this sort of holiday. And the great thing about London is it’s pretty damn easy to come up with a back-up plan that’s just as full of awesome. 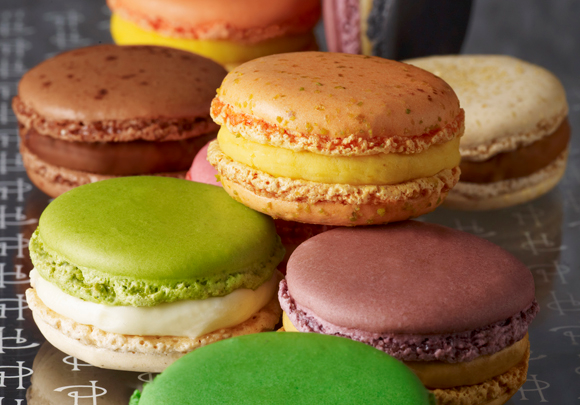 …and a macaron raid on Pierre Hermé. It’s almost inevitable that some things will go wrong when the week actually comes. Lowlights from last year included a three-hour train delay on the way down and a ‘meal’ at an Angus Steakhouse. But as long as the latter doesn’t happen again, I think we’ll be alright. I’m very much looking forward to it! **I don’t mean that really. I love the queen. She can thwart me all she wants.